Otorhinolaryngology /oʊtoʊˌraɪnoʊˌlærənˈɡɒlədʒi/ (also called otolaryngology-head and neck surgery) is a surgical subspecialty within medicine that deals with conditions of the ear, nose, and throat (ENT) and related structures of the head and neck. The specialty is often treated as a unit with surgery of the head and neck (otolaryngology–head and neck surgery, or OHNS). Doctors who specialize in this area are called otorhinolaryngologists, otolaryngologists, ENT doctors, ENT surgeons, or head and neck surgeons. Patients seek treatment from an otorhinolaryngologist for diseases of the ear, nose, throat, base of the skull, and for the surgical management of cancers and benign tumors of the head and neck. 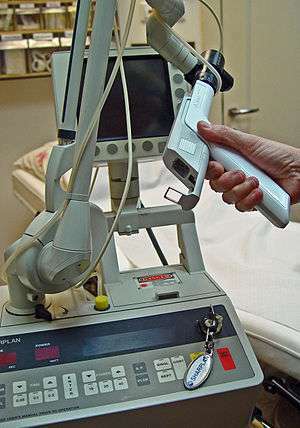 Otorhinolaryngologists are physicians (MD, DO, MBBS, MBChB, etc.) who, in the United States, complete at least five years of surgical residency training. This is composed of one year in general surgical training and four years in otorhinolaryngology–head and neck surgery. In Canada, practitioners complete a five-year residency training after medical school. 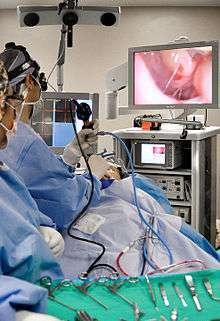 In the United Kingdom entrance to otorhinolaryngology higher surgical training is highly competitive and involves a rigorous national selection process. 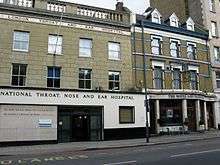 The training programme consists of 6 years of higher surgical training after which trainees frequently undertake fellowships in an otorhinolaryngology sub-speciality prior to becoming a consultant. Rhinology pertains to sinus diseases and the anterior skull base.